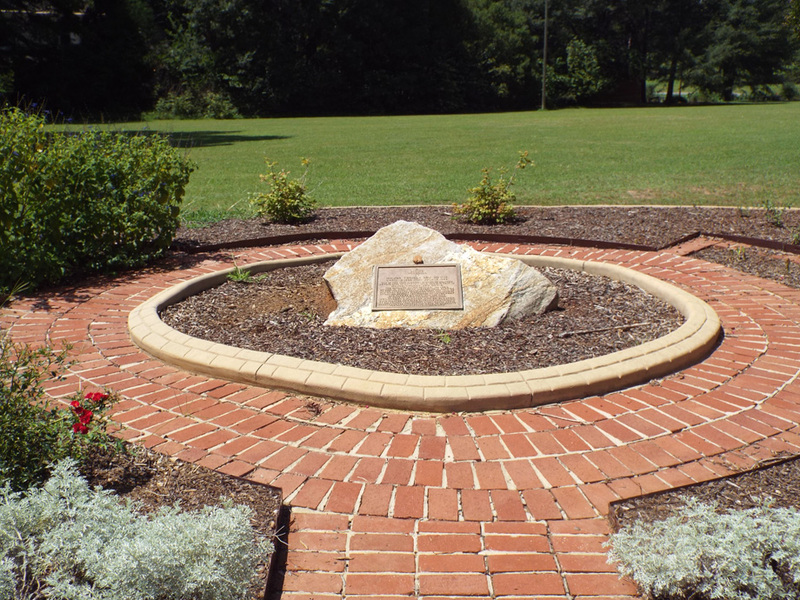 The prominent feature of the Howie memorial is a large, flat faced stone that has been tilted forward to hold the unadorned bronze plaque. A border of white landscape brick forms a circle around the stone and a red brick sidewalk wraps around this border with a walk leading to the street. A narrow band of landscaping holds two benches, plantings and mulch and is defined by a second band of white landscape brick that encompasses the circle feature and sidewalk. Plaque: A / LIVING / MEMORIAL / TO / MAJOR THOMAS DRY HOWIE / APRIL 12, 1908 – JULY 17, 1944 / ONE OF THE MOST GLORIOUS STORIES OF BRAVERY / BEYOND CALL OF DUTY IN WORLD WAR II IS THAT OF / MAJOR THOMAS DRY HOWIE / THE GALLANT MAJOR OF ST. LO WHO LED A / SUICIDE MISSION WHICH CLEARED THAT BARRIER / TO THE NORMANDY BEACH HEAD, BUT NOT TILL, HE / HAS GIVEN HIS LIFE DIRECTING THAT SUCCESSFUL / ATTACK. HIS DEVOTED MEN PRESSED ON VICTORIOUSLY / AND CARRIED HIS BODY INTO THE CITY / AT HEAD OF THEIR COLUMN. HIS SISTER, MRS. HUBERT S. PLASTER, AND DR. PLASTER / HAVE PLANTED THIS PARK ENTRANCE AS A TRIBUTE / TO HIS MEMORY THAT OTHERS MIGHT ENJOY THESE / PLANTS AND THE FREEDOM FOR WHICH HE LITERALLY / FOR GOT HIMSELF INTO IMMORTALITY. After Howie’s death and his men had entered the city of St. Lo, they carried his body to the rubble of a church. The photo of his body there draped with the American flag was one of the most famous of World War II. Many memorials have been placed to honor Howie. There are two in St. Lo to include one on the wall of Sainte-Croix in St. Lo where his body was placed after his death. It is thought that the character of Captain John Miller played by Tom Hanks in the movie “Saving Private Ryan” was based on Major Howie. 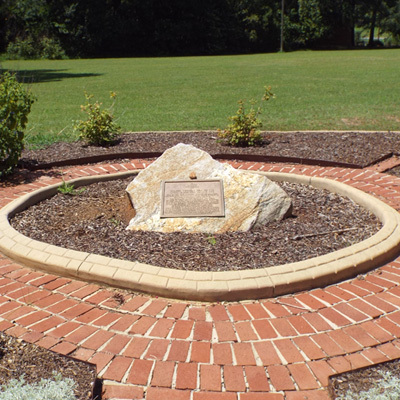 The memorial can be found at the intersection of Howie Drive and W. Marion Street near the Cleveland County Memorial Library, in Shelby, NC. The memorial complex is located on an open field with several scattered trees in a short distance of it.